Indianapolis, Indiana – Attorneys for Plaintiff, Amerifab, Inc. of Indianapolis, Indiana filed suit in the Southern District of Indiana alleging that Defendants, MELTER, S.A. a Mexican corporation; DE C.V., GERDAU AMERISTEEL CORPORATION, a Florida corporation; GERDAU S.A., a Brazilian corporation; and RAVAGNAN S.P.A., an Italian corporation infringed its rights in United States Patent No. 6,330,269 (“the ‘269 Registration”) for “Heat Exchange Pipe with Extruded Fins”. Plaintiff is seeking injunctive relief, judgment including statutory damages and attorneys’ fees. According to the complaint, Plaintiff Amerifab, Inc. manufactures equipment to be used in a variety of industrial machinery, including heat transfer equipment. Defendant Melter manufactures heat transfer equipment, pressure vessels, and markets in North America. Defendant Gerdau Ameristeel recycles scrap steel into products for the construction, industrial, agricultural, and automotive industries in North America. Gerdau Ameristeel is a wholly owned subsidiary of Defendant Gerdau, which operates subsidiaries primarily throughout South America. Defendant Ravagnan allegedly operates primarily out of Italy and South America, and specializes in design and construction of industrial plant and pressure vessels. Defendant Ravagnan is alleged the majority shareholder of Defendant Melter, and the two companies share facilities and employees. 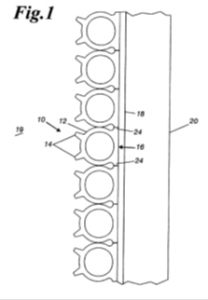 The patented pipe in question is a device used to cool the interior wall of an electric arc furnace. The pipe has thick walls and fins on the exterior, and can be placed “in a serpentine fashion…on the inside wall of an electric arc furnace to form a cooling surface between the interior and the furnace wall.” (quoting Complaint Paragraph 12). The patent was issued on December 11, 2001, to Richard J. Manasek and David P. Kincheloe of Greenwood, Indiana. Amerifab markets and sells the patented pipe under the “Amerispline®” trademark. Plaintiff asserts that by August 2016, Defendants Melter and Ravagnon manufactured, offered for sale, and/or sold industrial pipes that infringed on the ‘269 patent. Further, Plaintiff asserts that, in August 2017, Gerdau Ameristeel and/or Gerdau contracted with Melter to install infringing pipes in a facility in California. Plaintiff claims that a representative of Defendant Melter contacted Amerifab and inquired about purchasing the patented piping from Amerifab, thereby infringing their patent by offering for sale equipment that they were not licensed or authorized to market. Practice Tip: In this case, venue could be a contested issue. Patent infringement plaintiffs have a more difficult path to securing their preferred venue since the TC Heartland case. In that case, won by a Carmel, Indiana plaintiff, the U.S. Supreme Court took a narrow view of the where a company “resides” for purposes of patent infringement venue. In the Amerifab case, the plaintiff may have a difficult time securing proper venue for the foreign defendants. The case was assigned to District Judge Richard L. Young and Magistrate Judge Debra McVicker Lynch in the Southern District and assigned Case 1:17-cv-03580-RLY-DML.